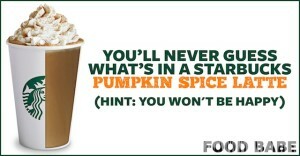 Today I woke up and heard that Starbuck's was bringing back their Pumpkin Spice Latte's early - like today early. While the anchors on the Today show happily sipped on their fall beverages I just couldn't get this blog post out of mind from the Food Babe. Vani Hari (The Food Babe) created a whole website about finding out what is really in our food and sharing it with all of us consumers. I saw her blog and want to share it with you all, just in case this is a fall treat you like to have. The great news is that you can much more easily make your own with clean, simple ingredients. Here's a link for homemade pumpkin lattes or mochas. Ok so if you really want to know what's on the ingredient list, read Vani's blog here!